David Robinson excelled in most sports that he tried in high school, except for basketball with a height of only 5’9. He grew to 6’6 by his senior year, made it to the basketball team and earned all-area and all-district honors, but still didn’t generate enough interest from colleges before joining the Naval Academy. By the time he took the court in his first basketball game for the Navy Midshipmen men’s basketball team, he had grown to 6 ft 9 in , and over the course of his college basketball career he grew to 7 feet. 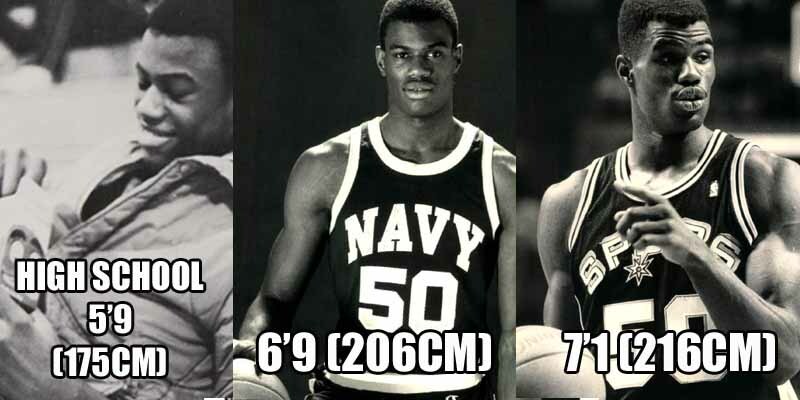 He became far too tall for active duty with the Navy, so he entered the 1987 NBA draft and the rest is history.